Although the weather might have been gloomy, the fashions at this year’s Oscars were simply magnificent. With mesmerizing, dazzling encrustations, lace detailings, and more, the designs expressed such remarkable, unforgettable artistry. Rosamund Pike looked incredible in this stunning red Givenchy gown at Sunday’s ceremony. This form-fitting design, with its richly hued coloration, textured floral appliqués, upper scalloped repetitions, cinched in corseted waist, deep v-cut on the bottom, and satin accents, evoked such beauty and craftsmanship in design. Cate Blanchett is always radiant on the red carpet and this year’s Oscars was no exception. Wearing a striking black velvet Maison Margiela gown, Blanchett looked absolutely breathtaking. And she exuded only more beauty and boldness with the stunning turquoise statement necklace she wore. Complementing the dark hued fashion wonderfully, the dazzling turquoise jewels emanated a quality of magical brilliance. In a glistening chartreuse Elie Saab gown, Emma Stone looked beautiful on the red carpet. This long-sleeved, sparkling creation exuded such finesse in design with its ornate beading and sheer detailing, patterned in such a way as to evoke the elements of the exotic world of nature. With Stone’s vivid red hair, the look was perfection. I cannot wait for next year’s ceremony! The Oscars was a fantastic end to award season. It was a show of beautiful appreciation for the wonderful, defining talents of the industry, for the thriving actors and actresses of the past and present, for the talents who were lost and will always be remembered for their impacts on the film world. It was a show for the whole film community. The Oscars was also a time of laughter, an environment of joyous humor and fun-filled gaiety and lightness, a time when the talents of film gathered together in spirit and welcoming merriment. And the Oscars was also a fantastic end to award season fashion. 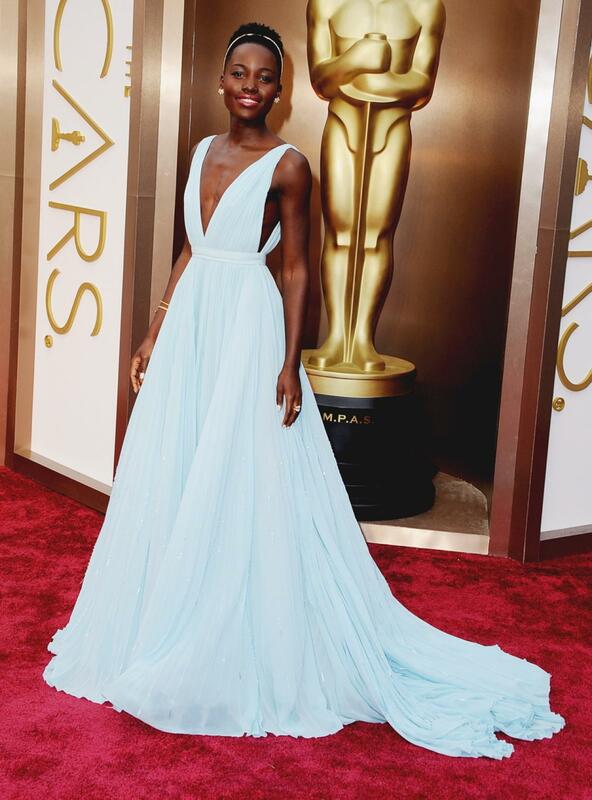 Lupita Nyong’o looked breathtaking in this stunning light blue Prada gown. This look was magnificent in its ability to carry with it both a magical delicacy and a quality of unquestionable fierceness. The flowing gown had this enchanting elegance, this unparalleled luminosity that shined in its angelic, pastel glory, that was beautifully mixed with this stunning fearlessness, this deep, striking v-cut down the center, that created a bold, fantastic look. Paired with a glistening golden headband, and other golden jewels, this look was perfect. Lupita Nyong’o is sure to rise in this film industry and I am very excited to see how she wonderfully develops in the future! This glistening whitened hued, form-fitting Atelier Versace gown looked absolutely fantastic on Kate Hudson. This look was marvelous in its shining classic beauty and new allure. This fluid Versace creation held within it unmistakable qualities of modernity, of timeless glamour heightened with an unforgettable, bold freshness that was simply magnificent. This creation, encrusted with sparkling ornamentations and further livened with a striking, matching draped cape, gave off feelings of empowerment, qualities of wonderful strength. With a plunging neckline and overall shining charm, Kate Hudson looked terrific. Cate Blanchett is one of the greatest talents in the world today. One cannot help but admire her incredible, unforgettable acting abilities on the screen and on the stage. She holds within her this marvelous strength, this power that gravitates the mind and spirit, that evokes the viewer’s emotions and allows one to fully comprehend the character she is playing. At this year’s Oscars, Cate Blanchett looked radiant in this blush Armani Privé gown. The gown had this lively grace to it, this breathtaking elegance that rose out of the design’s artistic brilliance and the designer’s skill. With the blushed sheer gown decorated with a variety of crystallized and pearl beadings and paired with matching earrings, Blanchett looked magnificent. I am so, so happy that she won the Oscar for Best Actress–the award she certainly deserved! I cannot wait to see the red carpet fashions during the next award show season!